I am a PhD candidate at Australian Catholic University, in partnership with Tennis Australia. I am also currently employed by Tennis Australia as the Sport Science and Athlete Development Analyst in the High Performance department. My PhD research focuses on understanding the relationship between training loads, musculoskeletal screenings, and injuries in sub-elite tennis players. The outcome of such research will potentially provide insight into the prediction and prevention injury occurrence and pervasiveness in tennis. Other current research I am involved includes the extensive and widespread sports data science behind professional tennis. I am an avid tennis fan and player with a background in grassroots tennis coaching. My passion for tennis has driven my desire to research and understand the physical, technical, tactical, and psychological aspects of the professional game. Sport science in tennis is an ever-evolving domain with new and innovative athlete monitoring and management systems, equipment, ball tracking technology, load-monitoring devises etc and I am very excited to discover and utilise this information to enhance the sport. 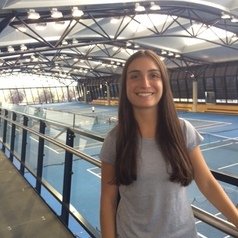 I studied Sport and Exercise Science as well as Commerce (majoring in sports management) as my undergraduate degrees and furthered my research skills during my Honours year in Sport and Exercise Science. During this time I was also a physical trainer and tennis coach. Hence, my breadth of understanding in tennis from a scientific, business, and physical point of view has helped to develop the foundations of my current PhD candidature role at Australian Catholic University, and in my role at Tennis Australia. Besides my academic and professional interests, I have a true love for adventure travel, every type of sport and physical activity especially running, boxing and water skiing, seeing live music, coffee, and spending time with my loved ones.